All RBC employees, including adjunct faculty and wage staff, and students enrolled for one or more credits are required to obtain a valid RBC ID card. Students residing on campus must have a valid RBC ID card to enter the residence halls. If a student is found to be using an RBC ID card that does not belong to them they will be subjected to sanctions from the student conduct board. To ensure the safety of the campus community. This policy is applicable to all employees and students of Richard Bland College. Employee or student information must be available in the campus ID Card Office database prior to a card being issued. The employee or student must sit for a photo of his/her face taken from the front. The facial image must be unobstructed (i.e., no sunglasses, headwear that obscures the face, etc. ; the only exceptions are items worn for cultural or religious reasons, except the face must be unobscured). The ID Card Office staff will produce the ID card and issue it to the employee or student who will sign a record of receipt for the card. This policy establishes parking and traffic rules and imposes the requirement of vehicle registration for faculty, students, and staff to park their vehicles on the College campus. All motor vehicles are subject to College traffic rules and Virginia traffic laws while on campus. The College assumes no responsibility for loss or damage to private property. All traffic signs must be obeyed. The operation of any motor vehicle in such a manner as to create excessive noise or smoke, or operation of any vehicle in a parking lot in an unsafe manner, will result in revocation of parking privileges. Pedestrians shall have the right-of-way at all times. The maximum speed for a vehicle on Johnson Road and Carson Drive is 25 miles per hour when classes are in-session. The College parking and traffic rules are designed to allow safe pedestrian and vehicular movement, to ensure emergency vehicles and personnel access to buildings and spaces, to provide orderly parking of vehicles on campus, and to provide for an equitable distribution of parking spaces with appropriate priorities. This policy applies to all College employees and students in the Richard Bland College community. Richard Bland College is a decal-controlled community. As such, all motor vehicles, including motorcycles and scooters, operated on campus by a person associated with the College must be registered for the current academic year with the College’s Department of Campus Safety and Police. a. For students – upon payment of tuition and fees. For faculty – upon hire and annually thereafter. Parking decals will be issued to students, faculty, and staff once they provide a valid operator’s license and the vehicle registration card of the primary vehicle and secondary vehicle they plan to use on campus. If there are any changes of the vehicles being used on campus, the student must notify the College Department of Campus Safety & Police immediately. All parking decals must be obtained and displayed by the beginning of the semester. Failure to obtain or display a parking decal is a violation of the Code of Conduct (students) and a violation of this College policy. All students, faculty, and staff must display an RBC parking decal. Decals shall be displayed on the backside of the rearview mirror located inside the vehicle. Students, faculty, and staff not obtaining or displaying their parking decal will be subject to a parking citation. All parking signs shall be obeyed. Any area that will interfere with the use of College facilities. Parking is prohibited at all times on all campus roads, at crosswalks, and in all fire lanes whether marked by painting in the lane or by signage. A vehicle must be parked in one space only and in designated parking areas, with marked spaces and lanes, leaving clear access to adjacent spaces, and without blocking driving lanes or creating a hazard for other drivers. Any motor vehicle or trailer parked in violation of College parking rules or abandoned on-campus is subject to removal and impounding at the expense of the owner or operator. Parking rules will be enforced from 8:00 a.m. until 5:00 p.m. Monday through Friday when school is in session, and citations will be issued to students, faculty, and staff for parking violations. Students and visitors are not authorized to park in Faculty/Staff parking areas, unless prior approval is received from the Campus Safety and Police Department. West side of Johnson Road at the Soccer Field. Student Village parking lots at Freedom and Patriot Halls. The Student Village provides parking to residential students, Residence Life staff, and approved visitors. Students must display a residential parking decal or proper visitor’s parking pass issued by the Office of Residence Life (ORL) or the Department of Campus Safety and Police for all parking, including any handicapped parking spaces. Residential students who are hosting guests must bring their guest(s) to the ORL Office during normal business hours to obtain a visitor parking pass. After normal business hours, the host may contact the on-duty Residence Hall Director to obtain a visitor parking pass. The visitor pass must be prominently displayed on the front dashboard of the vehicle so that it is visible through the front windshield of the vehicle. Parking citations will be issued for parking without the proper passes and are subject to fines and sanctions for violations. Visitors with approved visitor passes are permitted to park in the spaces designated for visitor parking. Students who are unable to obtain a student decal because it is after hours must contact the on-duty Residence Hall Director to obtain a visitors pass. Failure to have either a RBC decal or residence life visitor pass will constitute a parking violation. Residential students are permitted to use the visitor pass until the next available business day. All parking violation fines are assessed at $30. An additional delinquency penalty of $10 will be assessed for failure to pay fines within two weeks. Faculty and staff violations constitute a violation of College policy. No transcript or grades issued. No re-admittance until settlement of the account. Repeat offenders (three or more violations in a semester) and failure to pay fines (beyond a two-week delinquency period) can result in student discipline hearings. The appeal of a citation for a parking violation must be made in writing within fourteen (14) days of the issuance of the citation, and must be submitted to the Business Office. Appeals must be made by the person to whom the ticket is written. The Student Conduct Board will review and render a decision for all student violations. Decisions of the Board are final. Faculty and staff violations will be reported to the violator’s department head for personnel action. This policy is to provide regulations for a safe environment for the RBC Campus Community and visitors to RBC by restricting bicycles, skateboards, hoverboards, and related wheeled or hover transportation on campus (e.g., in-line skates, hoverboards, etc. ), while at the same time providing for the safety of all members of the campus community. These regulations do not apply to transportation for persons with disabilities (e.g., wheelchairs). This policy helps ensure the safety of RBC students, employees, and visitors. This policy governs the use of bicycles, skateboards, hoverboards, and other wheeled or hover transportation by students, faculty, staff, and visitors of the College. Bicycle policy: All bicycle users must adhere to state law relating to bicycles. Bicycle racks are provided by RBC for students to secure their bikes. Locking or leaning bicycles against poles, buildings, benches, trees, signs, porch railings, or other campus property is prohibited. Skateboard and other wheeled policy: The College permits the use of skateboards other similar wheeled equipment on the campus sidewalks only. Skateboards and other similar wheeled equipment may not be used on the streets, campus roads, the building porches, or on the walkway between the campus and the Student Village. Hoverboard and other hover equipment policy: Hoverboards and other hover equipment are prohibited on any campus-owned or controlled property. If a member of the College community has reason to believe that any member of the College community is missing, he/she must immediately notify the Department of Campus Safety and Police at 804-862-6111. The Department will initiate an investigation and generate a missing person report, as required by the Code of Virginia. The reporting member of the College community shall provide as much information as possible about an incident, especially if a description is available of the suspect, victim, and/or a vehicle. The Department of Campus Safety and Police will send out an alert via shared crime information networks with surrounding law enforcement agencies (Prince George and Dinwiddie Counties). If a member of the College community becomes aware or has reason to believe that a student who resides in residential housing is missing, he/she immediately shall contact Department of Campus Safety and Police at (804) 862-6111. The Department will initiate and investigation and generate a missing person report, as required by the Code of Virginia. If during the investigation it is determined that the student may have been missing for at least 2 hours or there is formidable information prompting immediate action, the Department will notify the student’s confidential emergency contact. Pursuant to the federal Higher Education Opportunity Act, if the missing student residing in residential housing is under the age of 18, the Department will notify the student’s parent or legal guardian immediately after it is determined that the student has been missing for at least 2 hours or there is formidable information prompting immediate action. Students residing on campus have the option to register a confidential emergency contact with the Office of Student Life. The confidential emergency contact will be notified by the Office of Student Life, Campus Police or other authorized campus official if the student is determined to be missing. This confidential contact information will be accessible only to authorized campus officials and law enforcement officers and it will not be disclosed outside of a missing person investigation. The federal Higher Education Opportunity Act of 2008 and Virginia Code §§ 15.2-1718 and 52.32 require this policy. This policy is applicable to the entire Richard Bland College community. All weapons are prohibited on any RBC-controlled property unless prior written approval is obtained pursuant to this policy. The possession, carrying, storage, or maintenance of any weapon by any member of the campus community, except law enforcement officials and other individuals authorized under this policy, is prohibited on College property. Any individual who is reported or discovered to possess a weapon on College property or maintains or stores a weapon on College property in violation of this prohibition will be asked to remove it immediately. The presence of a prohibited item will result in disciplinary action, which may include termination from employment for employees or expulsion from college for students. Exceptions to the weapons prohibition may be made only with appropriate written authorization as described below. Connected with training received by the employee in order to perform the responsibilities of his or her job with the College. Request for the authorization of an exception first must be endorsed by the head of the employee’s department or other college unit – typically a College senior administrator. Final authorization shall be made in writing by the Richard Bland College Director of Campus Safety and Chief of Police. Other Exceptions. Other exceptions must be authorized, in writing, by the Director of Campus Safety and Chief of Police in consultation with appropriate College offices. The Director of Campus Safety and Chief of Police will grant such exceptions only in limited circumstances, when the College has adequate assurance that an exception may be made without creating risk to campus safety and security. Due to the risk of being identified as a real weapon, any toy, prop, or other item that looks like a weapon and is used for any purpose on college property must be reported to and approved by the Richard Bland College Department of Campus Safety and Police prior to being used in any activity. Examples of activities for which prop weapon use may be approved include plays and class presentations. The purpose of this policy is to help provide a safe and secure working, living, and learning environment for the campus community by restricting weapons possession on College property. This policy applies to Richard Bland College. It applies to all visitors, students, contractors, and College employees, including faculty, hourly and wage employees, contract workers, and volunteers, (collectively, members of the campus community) on any property owned, leased, rented, licensed, or otherwise under the control of the College (College property). Violating this Weapons Policy or the Weapons on Campus regulation found at 8 VAC 115-30-20 of the Virginia Administrative Code is prohibited and may result in disciplinary action up to and including employment termination for employees and expulsion from college for students. “Police Officer” means law-enforcement officials appointed pursuant to Article 3 (§ 15.2-1609 et seq.) of Chapter 16 and Chapter 17 (§ 15.2-1700 et seq.) of Title 15.2, Article 3 (§ 23.1-809) of Chapter 8 (§ 23.1-800 et seq.) of Title 23.1, Chapter 2 (§ 29.1-200 et seq.) of Title 29.1, or Chapter 1 (§ 52-1 et seq.) of Title 52 of the Code of Virginia or sworn federal law-enforcement officers. “Members of the campus community” means all College employees regardless of status (e.g. full-time, part-time, temporary, faculty, adjunct, volunteer), students, contractors, and visitors. “College property” means any property, vehicle, or vessel owned, leased, or controlled by Richard Bland College. (10) any other weapon listed in §18.2-308(A) of the Code of Virginia. “Weapon” does not include items: (1) knives or razors commonly used for domestic or academic purposes; or pen or folding knives with blades less than three inches in length; or (2) mace, pepper spray, and other such items possessed, stored, or carried for use in accordance with the purpose intended by the original manufacturer. To request an exception to the weapons prohibition, interested personnel must complete the Request for Permission to Bring Unauthorized Items on Campus form and forward it to the Director of Campus Safety and Chief of Police for approval. The policy establishes the limitations on the presence of open flames in College buildings or on College property, and imposes the requirement for a permit for certain activities involving open burning or open flames. To provide safety policies, guidelines, and structure that minimize the dangers of fire and to prevent dangerous smoke or odor emissions. This policy applies to any College employee, student, or contractor in the Richard Bland College community. “Open Flame” means any activity or device producing a flame, including, but not limited to candles, tiki torches, oil lanterns, butane burners, incense, campfires, bonfires, grills, and fire pits. “College Property” means any property, vehicle or vessel owned, leased or controlled by Richard Bland College. Open flames are prohibited on all College property, including within College buildings and facilities, except pursuant to a permit issued by the College. Small celebration candles used briefly and in an appropriate quantity in connection with a celebration, provided such activity is not left unattended, is in an authorized location, is otherwise lawful, and the smoking or burning elements are safely and responsibly disposed. Persons seeking to ignite an open flame must apply to the Department of Campus Safety and Police for a permit to perform the activity. Permits may be issued for a one-time event or activity, or on a recurring or on-going basis. Applicants must apply at least five (5) working days in advance of the activity to ensure consideration. An applicant’s history of compliance with previous permits will be considered in a decision to grant a permit. Persons granted a permit are required to comply with all conditions of the permit. In addition to individuals authorized by College policy, Richard Bland College police officers and representatives of the Department of Campus Safety and Police are lawfully in charge for the purposes of forbidding entry upon or remaining upon College property of those who are in violation of this prohibition. Persons who fail to obtain a permit or to comply with its conditions are subject to arrest and to prosecution under the laws of the Commonwealth. Members of the College community are also subject to disciplinary action, including termination or expulsion. Richard Bland College is committed to promoting a safe and secure campus community. The RBC Violence Prevention Committee and Threat Assessment Team are hereby established to help prevent violence on RBC-owned or controlled property and at any RBC-sponsored event. The Violence Assessment Committee and Threat Assessment Team are required by Virginia Code § 23.1-805. The RBC President shall appoint the members of the Violence Prevention Committee and the Threat Assessment Team pursuant to the requirements of Virginia Code § 23.1-805 detailed below. Each Violence Prevention Committee shall include representatives from the Office of Residence Life, Campus Safety and Police, the Office of Human Resources, RBC counseling services, Student Success, College Counsel, and other constituencies as needed. The Violence Prevention Committee shall develop a clear statement of mission, membership, and leadership. Such statement shall be published and made available to the RBC Campus Community. The RBC Violence Prevention Committee shall (i) provide guidance to students, faculty, and staff regarding recognition of threatening or aberrant behavior that may represent a physical threat to the community; (ii) identify members of the campus community to whom threatening behavior should be reported; (iii) establish policies and procedures that outline circumstances under which all faculty and staff are required to report behavior that may represent a physical threat to the community, provided that such report is consistent with state and federal law; and (iv) establish policies and procedures for (a) the assessment of individuals whose behavior may present a threat, (b) appropriate means of intervention with such individuals, and (c) sufficient means of action, including interim suspension, referrals to community services boards or health care providers for evaluation or treatment, medical separation to resolve potential physical threats, and notification of family members or guardians, or both, unless such notification would prove harmful to the individual in question, consistent with state and federal law. The RBC Threat Assessment Team shall include members from the Department of Campus Safety and Police, mental health professionals, representatives from Student Success and Human Resources, and the College Counsel. The Threat Assessment Team shall implement the assessment, intervention, and action policies set forth by the Violence Prevention Committee. The Threat Assessment Team shall establish relationships or utilize existing relationships with mental health agencies and local and state law-enforcement agencies to expedite assessment of and intervention with individuals whose behavior may present a threat to safety. Upon a preliminary determination that an individual poses a threat of violence to self or others or exhibits significantly disruptive behavior or a need for assistance, the threat assessment team may obtain criminal history record information as provided in Virginia Code §§ 19.2-389 and 19.2-389.1 and health records as provided in § 32.1-127.1:03. No member of the Threat Assessment Team shall redisclose any criminal history record information or health information obtained or otherwise use any record of an individual beyond the purpose for which such disclosure was made to the Threat Assessment Team. Individuals and organizations wishing to exercise their freedom of speech or the right of the people peaceably to assemble, must register with the Office of Campus Safety and Police at least 24 hours in advance if exercising such speech or rights to assemble would in any way be disruptive to anyone within the campus community, including RBC employees or students. Standard space reservation procedures must be followed. If notice is given less than 24 hours in advance, the College will make every effort to grant such a request provided that safety and security issues and logistical concerns can be appropriately addressed. The location of the assembly will be determined by College officials in consultation with the organizers and will be based on safety and security concerns. It is not the intent of this policy to censor or otherwise limit free expression. However, exercises of free speech and rights to assemble must be peaceable, orderly, nondisruptive, and comply with College standards of conduct and other RBC policies. This policy provides guidance for the appropriate use of College space for free speech and assembly activities. This policy applies to all individuals and organizations wishing to use College facilities for free speech and assembly activities. The Clery Act Compliance Committee (CACC) is hereby created to ensure the College’s compliance with its obligations under the Clery Act, a federal law that requires all colleges and universities that participate in federal financial aid programs to compile and disclose information about crime on and near their campuses. The United States Department of Education monitors compliance, and can impose civil penalties up to $35,000 per violation against institutions for each infraction and can suspend institutions from participating in federal student financial aid programs. The members of the Emergency Management Team shall serve as the standing CAAC. The CACC shall work closely with College Counsel. The CACC shall review updates to law, policy, and procedures connected to the Clery Act in order to ensure awareness of and compliance with these obligations. Clery Act obligations include but are not limited to: (1) implementing policies and procedures; (2) compiling crime statistics; (3) publishing the annual security and fire safety report; (4) maintaining a 60-day crime log; (5) issuing timely warnings and emergency notifications; (6) identification and training of Campus Security Authorities; (7) and identification of Clery geography. The CACC shall ensure College compliance with Clery Act obligations, and shall engage other College employees and offices as appropriate. Establishing the Clery Act Compliance Committee (CACC) is necessary to ensure Richard Bland College’s compliance with the Clery Act. This policy establishes the Clery Act Compliance Committee and sets forth its duties. Members of the CACC are expected to perform these duties to the best of their ability, and all members of the College community (students, faculty, and staff) shall cooperate with the CACC in the performance of its duties. “Annual Security and Fire Safety Report” means the annual report required by the Clery Act, which includes crime statistics for the three previous calendar years, as well as various policies, procedures, and program disclosures about security and safety on campus. The Annual Security and Fire Safety Report must be disseminated to all College students and employees by October 1 each year, as well as made available to prospective students and employees. “Campus Security Authorities” include campus police personnel, campus security, individuals identified as persons to whom students or employees should report criminal offenses, and officials who have significant responsibility for student and campus activities (such as the Office of Residence Life and the Student Conduct Board). “Clery Act” means the Jeanne Clery Disclosure of Campus Security Policy and Campus Crime Statistics Act, §20 USC 1092(f). “Clery geography” includes: (1) Buildings and property that are part of the institution’s campus; (2) The institution’s noncampus buildings and property; (3) Public property within or immediately adjacent to and accessible from the campus; and (4) other areas within the patrol jurisdiction of the campus police or the campus security department. The CAAC Chair shall be chosen by the Director of Campus Safety and Chief of Police. The CACC shall meet as directed by the CAAC Chair, or as requested by the President. Virginia law requires medical care providers to notify public health officials of newly confirmed cases of certain communicable diseases so that testing of contacts can be pursued. Members of the Richard Bland College of William & Mary community who have been diagnosed with these reportable diseases are encouraged to self-disclose their diagnosis with the appropriate College official, and to cooperate with the College and the local health department to take such appropriate steps as will minimize the further transmission of the disease. The College is committed to providing, to the extent possible, a healthy and safe educational environment for all students and employees. The purpose of this policy is to help prevent the spread of communicable and reportable disease through measures that focus on safety, prevention, and education while prohibiting discrimination against persons afflicted with communicable and reportable diseases. This policy applies to students, faculty, and other RBC employees. “Communicable disease” means any condition which is transmitted directly or indirectly to a person from an infected person or animal through the agency of an intermediate host or vector or through the inanimate environment. Communicable diseases are spread via airborne viruses or bacteria or contact with human blood or other bodily fluids. In addition to viruses and bacteria, communicable disease pathogens include fungi and parasites. Often the terms “infectious” and “contagious” are used to describe a communicable disease. “Reportable disease” means a communicable disease required to be reported to public health officials. Reportable diseases are generally those of unusual significance, incidence, or occurrence and which may merit an epidemiological evaluation; these diseases are among the most importance from a public health perspective. Students diagnosed with communicable diseases are asked to report such diagnosis to the Associate Provost for Student Life. Employees with communicable diseases are asked to report such diagnosis to the Director of Campus Safety and Chief of Police. The Director of Campus Safety and Chief of Police shall inform the Emergency Management Team as appropriate of such diagnoses, maintaining the confidentiality of the student(s) or employee(s) to the extent such confidentiality does not interfere with the College’s ability to respond to an actual or potential public health concern. In the event of a communicable disease occurrence within the surrounding region or state that is clearly in excess of normal expectancy or reaches the outbreak classification, the College will monitor the situation by maintaining continual communication with local and state health officials to provide timely and appropriate updates to the College community. Depending on the severity or categorical aspect of a specific event, less serious communicable disease occurrences will be addressed on a case-by-case basis. The College also will consult with local and state health officials to provide specific instructions for individuals returning to the College following being infected by a reportable communicable disease. Faculty, staff, and students will not bring pets onto the campus while the College is in session. (Exceptions to this policy are authorized service animals and assistance animals, and when authorized in writing by the Director of Campus Safety and Chief of Police utilizing the form: Request for Permission to Bring Unauthorized Items on Campus.) Pets that are kept under control (for dogs, this means on a leash) may be brought on-campus when the College is not in session. If a pet poses a risk to the health or safety of others, the Owner may be asked to remove the pet from campus. Pets must be well-groomed and free of pests such as fleas. Pets must be in good health and current on vaccinations and immunity shots as recommended by a veterinarian. The Owner must provide the Director of Campus Safety and Chief of Police a copy of the veterinarian’s statement regarding the pet’s health and vaccination status, signed by the veterinarian within the last 12 months. A valid vaccination tag must be worn by the pet at all times. The Owner shall be responsible for removing the pet’s waste, which must be placed in a closed container and removed to an outdoor trash bin. The Director of Campus Safety and Chief of Police may make exceptions to this policy in exceptional cases. The Owner is responsible for any damage caused by the Owner’s pet. In the event of significant or repeated damage caused by a pet, the Director of Campus Safety and Chief of Police may rescind permission for the Owner to have the pet on campus. The Director of Campus Safety and Chief of Police may rescind an Owner’s permission to have a pet on campus if the Owner fails to comply with the terms of this policy. The presence of pets on campus can result in health, safety, or maintenance issues. This policy applies to students, faculty, staff, and visitors. “Owner” means the individual who has brought a pet to campus. The Owner may be a student, faculty member, staff member, or visitor. “While the College is in session” means the consecutive period of time between the first day of classes in a semester until the last day of the exam period of a semester. The term does not include the period of time between the semesters in the winter and summer. To provide safety policies and guidelines for the protection of Richard Bland College employees and students who have a potential for occupational exposure to bloodborne pathogens, such as Hepatitis B Virus (HBV), Human Immunodeficiency Virus (HIV), and Hepatitis C Virus (HCV), among others. This policy applies to any employee who may have occupational exposure to Blood or other potentially infectious materials. The Exposure Control & Hazard Communications Plan provides the policies and procedures required regarding occupational exposure to bloodborne pathogens. 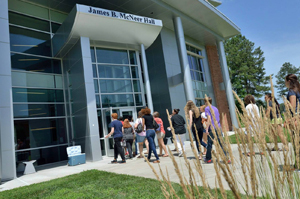 Richard Bland College has developed a Chemical Hygiene Plan to describe the policies and procedures that will promote the safe operation of the College science laboratories. This Chemical Hygiene Plan satisfies the requirements of the U.S. Department of Labor, Occupational Safety and Health Administration, 29 CFR Part 1910.1450, Occupational Exposures to Hazardous Chemicals in Laboratories. Some safety policies and practices adopted at Richard Bland College may not be required to be included in the Chemical Hygiene Plan, but the policies and practices may be critical to the planning process for maintaining a safe environment for employees and students. Setting the minimum physical space per student is an example of a policy that affects the establishment of a safe environment, but is not required by the 29CFR1910 to be included in the Chemical Hygiene Plan. This regulation is enacted for the protection of all employees, public and private. However, the College extends the provisions of the Chemical Hygiene Plan to our students as well. The procedures are found in the Exposure Control & Hazard Communications Plan. The Richard Bland College Hazard Communication Program is based on the requirements of the OSHA Hazard Communications Standard, 29 CFR 1910.1200. To ensure that information about the dangers of all hazardous chemicals used by Richard Bland College is known by all affected employees, the following hazardous information program has been established. Under this program, you will be informed of the contents of the OSHA Hazard Communications standard, the hazardous properties of chemicals with which you work, safe handling procedures, and measures to take to protect yourself from these chemicals. This program applies to all work and teaching operations at Richard Bland College where you may be exposed to hazardous chemicals under normal working conditions or during an emergency situation. All staff, faculty, and students will participate in the Hazard Communication Program. Copies of the Hazard Communication Program are available in the Richard Bland College Human Resources Office for review by any interested employee. The Richard Bland College Deputy Director of Emergency Management is the program coordinator, with overall responsibility for the program, including reviewing and updating this plan as necessary. I Reason for PolicyTo ensure the proper handling of personal property that is lost or found, or personal property that has been abandoned by its owner. The Department Of Campus Safety and Police is the host for the College’s Lost and Found Center (“Center”), which is located on the east side of the campus at 510 Carson Drive, South Prince George, Virginia. This is the only lost and found location authorized on campus. Any item of tangible personal property that appears to be lost or abandoned on the Richard Bland College Campus will be hand delivered to the Department of Campus Safety and Police and placed in a secure area. The Campus Police will maintain a record of all tangible personal property that has been transferred to them. No lost or abandoned property shall be sent to the Center through interoffice mail. If hand delivery is not possible or practical, anyone finding lost or abandoned property shall call the Campus Police at 862-6111 and a campus police officer will retrieve the property. The Campus Police shall make reasonable efforts to identify the owner of the lost or abandoned property. Such efforts will continue for at least 120 days. In the event that the owner is found, the Campus Police may charge the owner a reasonable fee to defer the costs of storing the property. Campus community members should never attempt to identify or contact the owner as this may cause confusion. In order to release recovered property to an owner, the owner must show valid government-issued identification and sign a release document. People who have lost property may complete a Lost Property Report (“Report”) at the Lost and Found Center. This Report shall be used to cross-reference and match any property that may have been delayed in reaching the Center. At the end of the Fall and Spring Semesters, the Department of Safety and Campus Police may sell the property to the highest bidder at public auction or by sealed bid at whatever location the College reasonably determines affords the most favorable market for the property. The College may decline the highest bid and reoffer the property for sale if it considers the price bid insufficient. The net proceeds of any such sale shall be held for at least 90 days, and if no claim is made on the property within that time, such funds shall be credited to the College’s operating fund. If the College determines that the probable cost of sale of property will exceed the sale proceeds, the property is inherently dangerous, or the property may not lawfully be sold or used, the College may provide for any such property, as appropriate under the circumstances, to be destroyed or discarded at an appropriate location, retained for use by the College, or donated to an appropriate charitable organization. Any sale pursuant to this subsection shall be preceded by reasonable notice of the sale, taking into consideration the type and value of the property. Such notice shall include at minimum the posting on a student bulletin board and publication in a school newspaper or similar publication. The College, by the same time, shall mail notice of the sale to the last known address of any person that the College determines to reasonably appear to be the owner. This policy applies to all persons who find or who have lost personal property on the RBC campus or other locations owned, operated, or leased by the College. Tangible Personal Property: For purposes of this policy, tangible personal property is defined as any property, other than a registered motor vehicle, that has physical form and characteristics.